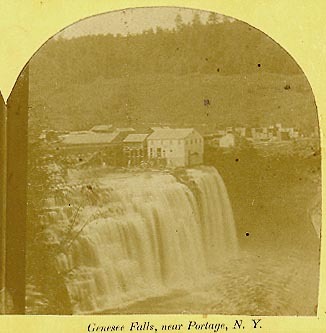 This view of the Middle Falls was taken before 1858. The first saw mill was built at the Middle Falls in 1824, with other mills, sheds, and a lattice bridge being added over the next 30 years. The natural beauty of the Falls (as well as the nearby trees) are just about gone! A fire in January of 1858 destroyed the largest mill. Also see Image 123 for another view of the mill.